Ever since the conclusion of Mad Men and his subsequent (and long-deserved) Emmy win for his work on the show, we’ve been wondering what Jon Hamm would tackle next. Sure, he went away to camp, but since he has no interest in doing a superhero movie, we worried he might end up in another regrettable sports flick. 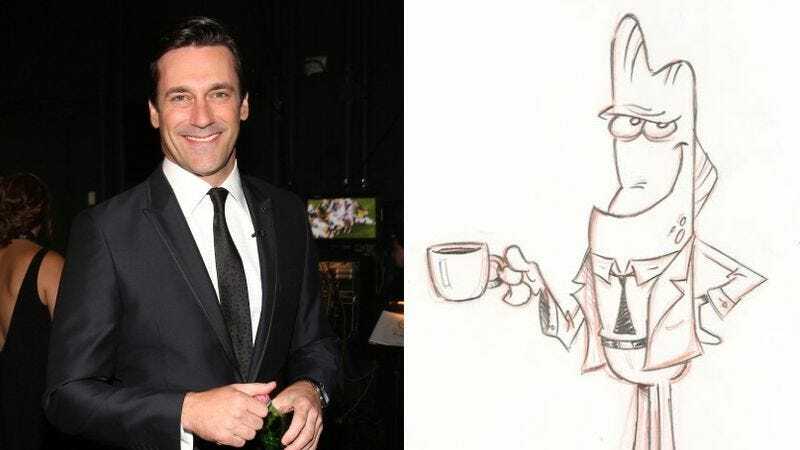 But according to Vulture, Hamm’s next role won’t take him far from his old stomping grounds—he’ll soon guest star on SpongeBob SquarePants as an ad man. Hamm will voice Don Grouper, a “charming head ad executive” who will reportedly dream up a campaign for frozen Krabby Patties, a new item that Mr. Krabs and SpongeBob will be pushing. Variety reports he’ll also be a partner in Grouper, Goby, & Koi. There’s currently no word whether or not John Slattery will join Hamm on Madisea Avenue (Madisunken Ship Avenue?) as Roger Sturgeon, or if Christina Hendricks will provide the voice of Joan Halibut. And now that we’re all out of fish puns, we’ll stop speculating.